Now I'm not one to really talk about beauty and skincare, however one of my New Year's resolutions was to look after my skin and appearance more. Not because I'm super vain or anything, just because I think everyone should take pride in their appearance and look after their bodies in every respect. Being active can really take its toll on your skin, the constant sweating and showering can dry your skin out, and cause breakouts if you don't get into a good routine. So I thought I'd share my skincare routine and how I keep things clean exercising so often. I used to use micellar water which is fantastic, but after running out of my last pot I just kept forgetting to buy more and eventually I was given this lovely soap as a replacement by an amazing client. Faith in Nature are an all natural, vegan beauty company that make top quality products that are good for your skin. I have the grapefruit soap and before you judge me for using soap to wash my face let me tell you why this one is different. Firstly, it's made with 100% natural ingredients and uses essential oils to get the beautiful scent, so I know that nothing bad is going on my skin. Also, unlike most soaps that leave your skin feeling tight and dry after washing, this one leaves your skin feeling silky and soft, something that has never happened with soap. When you're spending time sweating it out in the gym, exfoliating is an essential part of your skincare routine to ensure any nasty bits are cleaned away. Lush is one of the best places to go for natural skincare and their Mask of Magnaminty is my favourite skincare product ever. You can use it as an exfoliator or keep it on longer as a mask, it is lumpy enough that you can feel it working into your skin but not too rough that it feel as though it is drying it out. It has been made with peppermint and marigold oil to produce a lovely refreshing scent and contains evening primrose seeds and aduki to gently exfoliate. As with all of their products, this is suitable for vegans and cruelty free. For any of my moisturising needs I use Korres, a Greek company that make high quality, natural products focused around their wild rose ingredient. 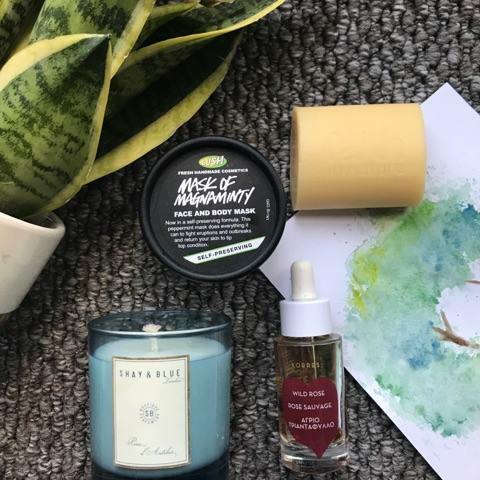 After exfoliating, I use the Advanced brightening and moisturising oil, place a few drops on my skin and rub in to leave my skin feeling super soft. It is fantastic if you suffer from dry skin like me as it gives it that extra bit of oomph it needs. The oil is rich in omega 3,6 & 9 fatty acids and vitamins A & C that promote collagen synthesis, this helps to reduce the appearance of wrinkles. It contains real rose petals (so it looks really pretty) and 94.5% full of natural ingredients. Then to finish my routine I use the 24 Hour Moisturising and Brightening Cream which contains rose oil, antioxidants and vitamin C. These ingredients help to repair the skin and look after skin pigmentation disorders. The best thing about this cream is that a little goes a long way, it soaks straight into your skin and doesn't leave it feeling oily or slippery. Again suitable for vegans and contains 84.6% natural ingredients. Really, after looking at those pictures I don't really even need to say anything, I bet you're drooling already aren't you? 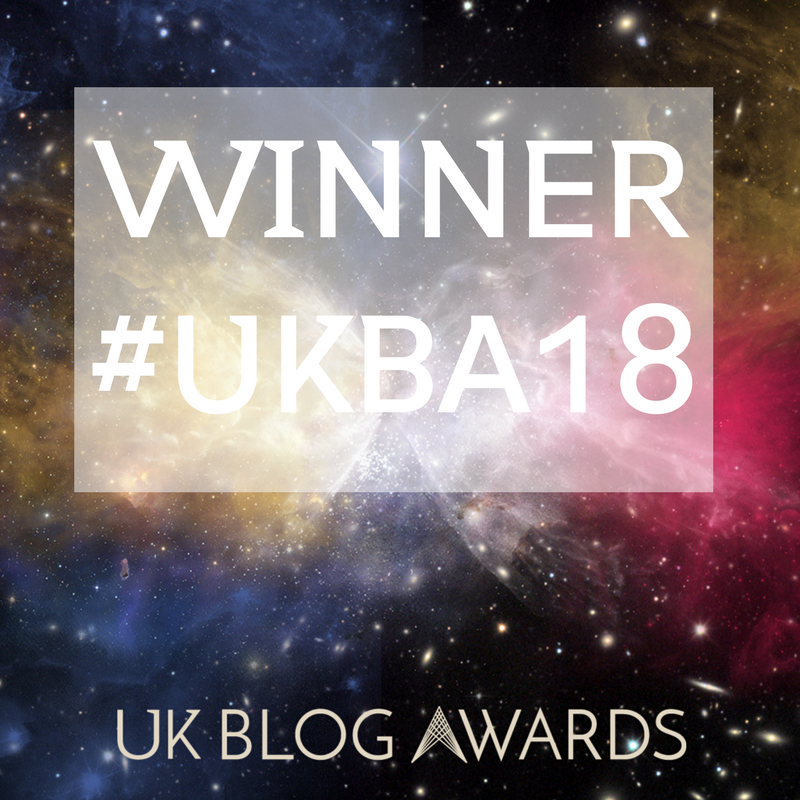 But as this is a written blog so I must go on. I chose pancakes, bacon and maple syrup, it's my go to brunch meal and I can never get bored of it, so I have a taste for it and can separate the good from the bad. This was incredible. 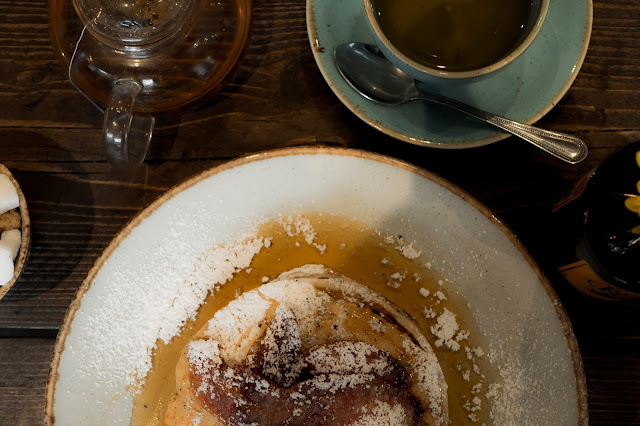 I'll admit, i've never had icing sugar sprinkled on top but I definitely can't complain, the pancakes were thick and fluffy and as always, the perfect combination with salty bacon. 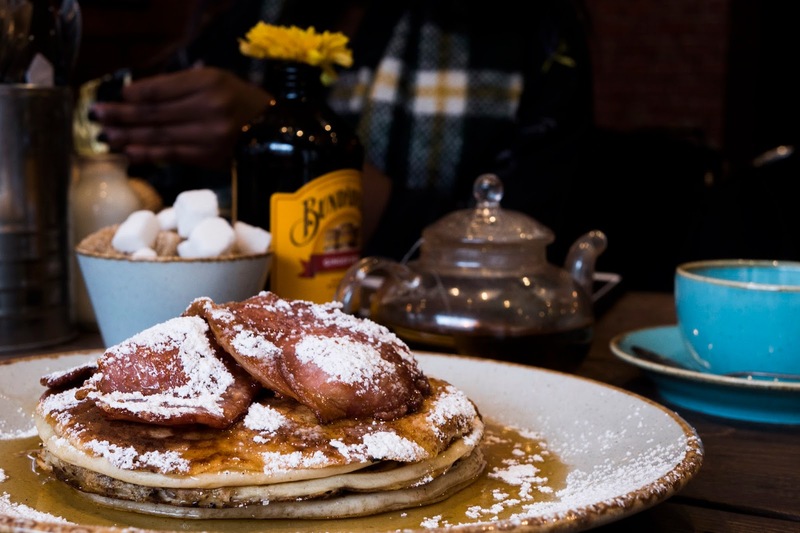 If having a sweet for brunch isn't your thing do not worry, there is so much more available for you to sink your teeth into. 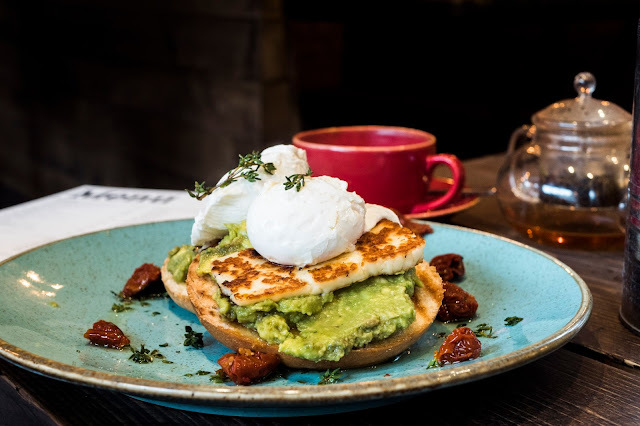 On the brunch menu (served until 3pm) food ranges from your classic full english to a grilled cheese toastie if you're on the go. Or even if you're wanting to eat a little later, the lunch menu is available until 5pm and you can find sandwiches and paninis or even take things a bit further with a veggie burger. But it doesn't even stop there...As it says in the name, Cafe Bar, you can have your morning coffee there or sit back and enjoy a cocktail with friends in the evening. It is open till late Thursday-Saturday and you can head down for open mic night on a Thursday. You could pretty much stay there from dusk till dawn and never have to leave. 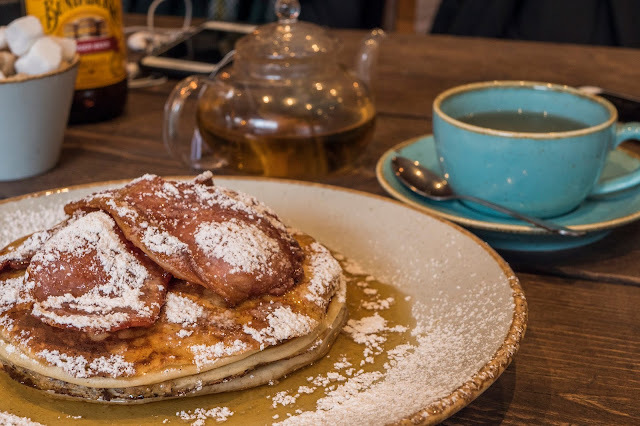 Now with it being pancake day today, I'd suggest you get down to 19 Cafe Bar ASAP and get onto their pancakes, you can opt for the salty bacon stack like me or if you've got more of a sweet tooth have them topped with fresh fruit and a drizzle of syrup, the choice is yours!